Today's cult-tv faces gallery focuses on devils and demons as they appear throughout cult television history. There are several images there, as you can see, and these monstrous creatures have appeared in numerous guises, on numerous programs. Some other notable TV installments, including Kolchak: The Night Stalker's "The Devil's Platform" involve the Devil's interference in mankind's affairs without actually showcasing Satan physically. In particular that Kolchak episode involved a politician (Tom Skerritt) who had made a deal with the devil. A devil or demon is the ultimate personification of evil, in cultural shorthand, the enemy not just of man, but of God Himself. The devil is a tempter, seducer and prince of lies, and demons represent his devoted minions. In terms of cult television, the Devil is perhaps, then, the ultimate enemy a hero could face off against. It's one thing to fight serial killers, Klingons, or government conspiracies, it's another to go head-on against Evil Supreme, in the form of Lucifer. The Twilight Zone, created by Rod Serling, offered an inventive twist on the Devil, one that accounted for periods of peace and war in humanity's long history. In the second season's "The Howling Man," a sick traveler was tricked into releasing a strange, howling man from custody inside a religious monastery. That howling man was Satan himself, and the traveler had to devote his remaining years to re-capturing the Devil. As long as Satan was free, man would find himself at war, and in perpetual strife. But those years when Satan was a captive accounted for our progress and years of peace. "The Howling Man" utilized the symbolism of the Devil to reveal something about the better and worse angels of human nature. In Star Trek, the Devil has been referenced several times. 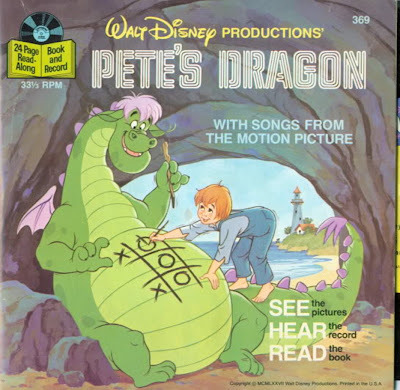 In the original series, a first season episode was titled "The Devil in the Dark" and it concerned a monster lurking in the shadows on a mining planet. Over the course of the episode, that "devil" was determined to be a mother Horta protecting her eggs, and so, again a powerful idea about our perception of evil was transmitted. The Horta had literally been "demonized" as a devil, a monster, until its motivations and nature was understood. In "Day of the Dove" on Star Trek, a Klingon commander Kang (Michael Ansara) noted that Klingons had no devil "but understood the habits of" ours. This meant, at least subconsciously, that Kang had knowingly taken on the attributes of the Devil, torturing Chekov, for instance, and inflicting pain and suffering on humans. Star Trek: The Animated Series actually featured a race of alien beings who were responsible for Earth mythology about the devil. In "The Magicks of Megas Tu," the Enterprise encounters Megas-Tu, a world populated by ageless creatures with pointed ears and horns (the stereotypical Satanic guise). One creature, Lucien is put on trial, and Kirk is forced to defend him, arguing against stereotypes which conjure images of evil beings. Such imagery, the episode suggests, is the product of superstition and primitive thinking. Talk about sympathy for the devil! 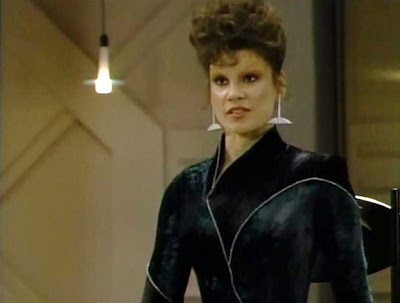 Star Trek's most famous personification of the Devil may be Ardra (Marta Du Bois) in the fourth season episode of The Next Generation, "Devil's Due." Here, the entire population of a civilized planet surrenders to fear and anxiety when a woman claiming to be their Devil, Ardra, arrives to claim their souls in accordance with a thousand-year old contract. 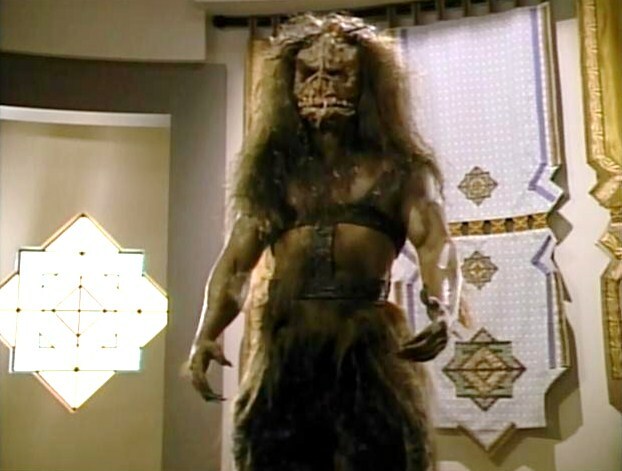 Ardra takes the form of Feklar, a Klingon devil...even though they aren't supposed to have one! Later, Ardra assumes the form of Satan with the stereotypical red skin, horns, etc. In the course of the episode, Picard exposes Ardra as a flim-flam artist, a woman playing on, again, primitive superstitions and beliefs. "Devil's Due" captures the essence of Gene Roddenberry's humanistic philosophy perfectly. I remember seeing an interview with the Great Bird of the Galaxy in 1991 in which he stated that aliens didn't build the Egyptian pyramids (in keeping with the Chariot of the Gods template), but humans did. Why? Because humans are clever and ingenious, and capable of great things. That's very much the message Captain Picard carries to Ardra's would be "property," the civilized population of a peaceful planet. These men and women had a thousand years of peace not because of a contract with some mythical, supernatural being, but because the people of the planet worked hard to achieve that peace, themselves. Once again, Star Trek eschews superstition and champions mankind. Although Space: 1999 did not feature The Devil, per se, one Year One episode, "End of Eternity" might be analyzed as a metaphor for Lucifer's story. Written by Johnny Byrne, the tale involved a once well-regarded alien scientist Balor (Byrne's play on the name of a demon, Baal) who has been "cast out" from his planet Pogron, because of his sadistic ways. Commander Koenig (Martin Landau) doesn't send Balor back to Hell, but he does kick the immortal being out of a nearby airlock, in a climax that forecast the last act of Alien (1979). In Battlestar Galactica, Satan was personified by the charismatic Count Iblis (Patrick Macnee) a renegade from a race of angels. Iblis was bent on twisting the humans of the rag-tag fleet to his diabolical will, and performed three "miracles" to gain the trust of the people. Iblis also seduced Sheba (Anne Lockhart), nearly displaced Commander Adama (Lorne Greene) as leader and even killed Apollo (Richard Hatch) before the angels on the "ship of lights" decided to intervene in human affairs. In "War of the Gods," Iblis most often appeared as a regal, dignified human male, but when struck by the energy discharge from colonial pistol, he revealed his horrifying, demonic visage. In the worlds of Buffy the Vampire Slayer and Angel, demons aren't mere mythology or superstition, but a kind of despised racial minority living in secret amongst the human race, trying to assimilate. Like human beings, these demons run the gamut from incomparably evil to quite friendly (Doyle, Lorne, Anya etc.). The point seems to be not to judge a whole group of people by the actions of one, or a few. Nonetheless, Buffy routinely and without question stakes vampires, perhaps because this particular brand of demon lacks a soul. Chris Carter's Millennium depicted a world in which demonic evil could occasionally interface with man's. Although the series often featured human brands of evil in terms of serial killers, stand-out episodes such as "Lamentation" "Powers, Principalities, Thrones and Dominions," and "Somehow Satan Got Behind Me" suggested that demons were making mischief in the world of man, spurring him on to greater evils ("Room with No View"). "Lamentation" introduces the quite-possibly demonic Lucy Butler (Sarah-Jane Redmond) to the series, and Lucy captures both our revulsion at and attraction to Evil. She is a seducer, a temptress...and an absolute monster, one of television's all-time classic characters. Lucy reminds us that the Devil isn't always a beast...but sometimes, and terrifyingly, a beauty. Over the years, programs such as American Gothic (1995 - 1996), Brimstone (1998 - 1999) and Reaper (2006 - 2008) featured the Devil (or a demon, in the case of Lucas Buck, perhaps) as primary characters, ones living and breathing in the world of man, and directing the world towards darker destinations. In American Gothic, Buck seemed intent on raising his son, possibly an Anti-Christ. In Brimstone and Reaper, the Devil was a very bad boss, one charged with returning evil spirits to the prison of Hell. In all three of these instances, the Devil boasted a wicked sense of humor about his sinister "work." In some cases -- on Brimstone and Reaper -- the Devil actually seemed to be a pretty nice guy at times. But of course, that's all part of Old Scratch's trickery, isn't it? Fine piece on the subject of 'Old Scratch', John. I know you were limiting this to the category of television, but I always found the premise of John Carpenter's 'Prince of Darkness' quite compelling (especially as an entity who attempts to bring the 'Anti-God' into our dimension). Very interesting, and timely. I'm finishing author Ken Bruen's 'The Devil' novel in the Jack Taylor series as I write this. It has the thought-provoking mash up of crime fiction, the after-effects of Ireland's debt crisis, and the metaphysical (with you-know-who becoming absorbed with the author's very flawed protagonist). Thanks for this. 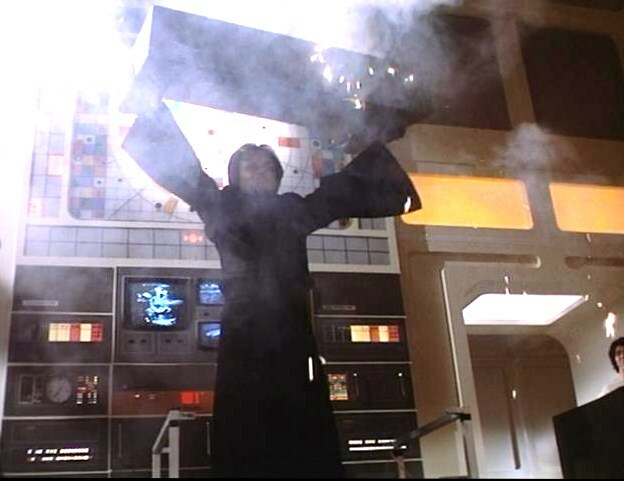 Prince of Darkness is one of my favorite meditations on Evil, and the Devil, absolutely. It's a great and under-valued film, so I'm glad you brought it up, even though the meme today is limited to cult tv. I'm curious about the book you described. I haven't read any of that series. Do all the novels (and how many are they?) feature a supernatural angle?